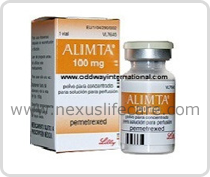 Uses:- Alimta Powder Injection is used to treat mesothelioma, a form of lung cancer associated with exposure to asbestos. Alimta Powder Injection is also used to treat non-small cell lung cancer that has already been treated with other cancer medications. Side Effects:-Pale skin, easy bruising or bleeding, unusual weakness, fever, chills, body aches, flu symptoms; white patches or sores inside your mouth or on your lips; urinating less than usual.